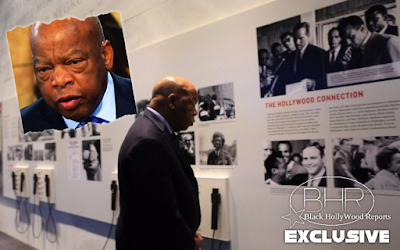 BHR Hollywood Reports............Rep. John Lewis (D-Ga.) was overcome with tears during a recent CNN segment shot at the Center for Civil and Human Rights in Atlanta. Lewis, who is a Civil Rights icon, was there to have a conversation with former Obama campaign manager and CNN host David Axelrod about Lewis’ experiences leading the Student Nonviolent Coordinating Committee (SNCC). He was overcome by the audio aspect of the exhibit, which helps guests experience the brutal harassment endured during the nonviolent protests that Lewis often led. You can hear beatings, slurs, and abuse being thrown at the peaceful protesters. “How painful is it to hear those scenes?” Axelrod asked Lewis after the congressman listened to the audio. The congressman, who is stone-faced for a few seconds, then breaks down into tears.